During the morning of August 24, California's Napa Valley was struck by its biggest earthquake in a quarter century. 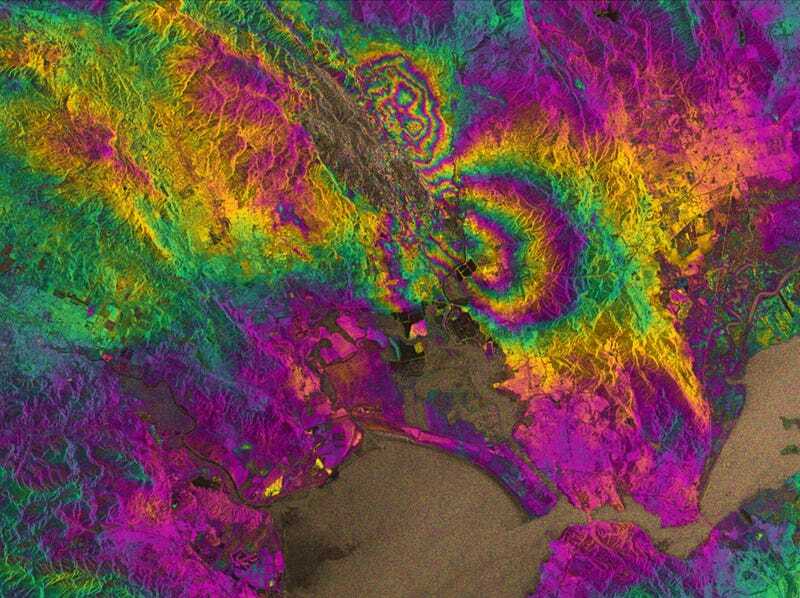 The ESA's brand new Sentinel-1A satellite has now produced an unprecedented visualization of the ensuing rupture. The image above was created by comparing radar images from August 7 and 31. The two round shapes around Napa valley indicate the degree to which the ground moved during the earthquake. Each colour cycle corresponds to a deformation of 28 mm. The maximum deformation is more than 10 cm, and an area of about 30x30 km was affected. The visualization also maps the infamous San Andreas Fault which runs along the coastline. There are other ways of visualizing earthquakes, including the USArray project which shows how earthquake waves travel across massive expanses of landmasses.